I don't have a ton of time to write today, as I have to get up early for work in the morning, but I thought that yesterday's 5-4 10-inning win over the Tigers could not go uncommented-opon by Twins Chatter (however brief those comments may be). 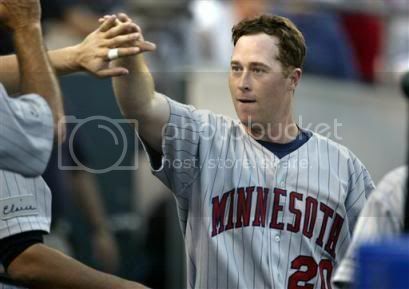 The title to this post sums it up best: Tuesday's victory was truly one for the 2004 version of the Twins, as opposed to the 2002 or 2003 versions. Lew Ford, Justin Morneau, Grant Balfour, and Joe Nathan all played key roles in the win. None of the those players contributed much (if anything) to the Twins' back-to-back division titles. Lew Ford's hustle double was the play of the day in my mind. That hit exemplified everything that is great about the Official Player of Twins Chatter: Lew is an aggressive player who goes all out 100% of the time. If Lew collects a single instead of a double, perhaps the Tigers don't pitch around Morneau as much (he was walked on four pitches), which would have changed the complexity of the inning. Morneau also delivered the game's big blow, a three-run homer. Even though he did look foolish in an at-bat against Estaban Yan, there is no way that this guy is going down to AAA again. No way. Perhaps the most encouraging sign to emerge from the win was the performance of Grant Balfour, who had three scoreless innings, after he almost single-handedly lost the series finale against the Royals. This is the reason the Twins kept this guy around when he was struggling early in the year. Balfour has electric stuff and a fastball that just jumps out of his hand. I'm not sure about the reports that say he was throwing 100 mph out there, but I do know that the Tigers did not stand much of a chance against his heat. Last season, a one-run lead in extra innings against one of the league's best lineups would have hardly seemed safe. Eddie G. would have undoubtedly surrendered at least two baserunners before finally ending the game on a deep fly ball to center field. Nathan, on the other hand, comes into the game throwing 97 mph and blowing it by the Tiger hitters. It was almost a foregone conclusion when "The Nathanest of Joes" entered the game. I don't know about the rest of you, but I think it's nice to have fingernails left after your closer ends the game. Thats all I have time for today, Twins fans. Sorry about my brevity, but this pesky thing called life keeps getting in the way (which is rather annoying). I promise that I'll have something much more substantial for tomorrow. Good night.